The Light Fingers Stakes is a Group 2 sprint held at Royal Randwick Racecourse during the Sydney Autumn Carnival for 3YO fillies. The Light Fingers Stakes is a Group 2 race held at Royal Randwick Racecourse in Sydney every February worth $200,000 in total prize money. Run over a distance of 1200m, the Light Fingers Stakes is open to three-year-old fillies and is contested with set weights. It takes place on Apollo Stakes Day during the Sydney Autumn Racing Carnival and is accompanied by three other Group status races: the Group 2 Apollo Stakes (1400m), Group 3 Southern Cross Stakes (1200m) and Group 3 Triscay Stakes (1200m). The race is named in honour of New Zealand bred mare Light Fingers who won the Melbourne Cup in 1965 and was the first Cup winner for legendary trainer Bart Cummings. Many of the fillies in the Light Fingers Stakes field are kicking off their autumn campaigns, and some may have run in the Group 1 Flight Stakes (1600m) at the track during the spring including in 2016 – 2017 when Global Glamour won both races, and in 2017-18 when Alizee repeated the same double. Fillies out of the race often continue on to contest later season features including the recently upgraded Group 1 Surround Stakes (1400m) on Chipping Norton Stakes Day and even the Group 1 Vinery Stud Stakes (2000m) in March. The Light Fingers Stakes 2019 runs on Saturday February 16, 2019 . The Light Fingers Stakes 2019 odds and betting market links to Ladbrokes.com.au will be provided below the week of Apollo Stakes Day. 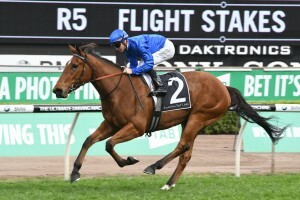 The Light Fingers Stakes field attracts a quality line-up of the autumn’s best three-year-old fillies, many of which are first-up off spring races including the Thousand Guineas in Melbourne. The official Light Fingers Stakes 2019 field and barriers will be announced on Wednesday February 13, 2019 and published in full below. The 2019 Light Fingers Stakes nominations will be published here once released by Racing NSW on Monday February 11, 2019. The Light Fingers Stakes was classified as a Listed race from 1983 until 1985 before it was granted Group 2 status in 1986. However, in 1987 the race status was changed to Group 3. In 1991 the Light Fingers Stakes regained it’s Group 2 status and has held it ever since. Notable recent Light Fingers Stakes winners include Global Glamour (2017) who won the previous spring’s Flight Stakes – Thousand Guineas double, Sweet Idea (2014), Sea Siren (2012) and More Joyous (2010). See below for the Light Fingers Stakes results dating back to 2000.